Ezt a terméket eddig 31 alkalommal vásárolták meg! King Diamond Clock Deluxe Herb Grinder. When it comes to style this herb grinder steels the show. This grinder features a convenient 2 chamber design with pollen screen and compartment. 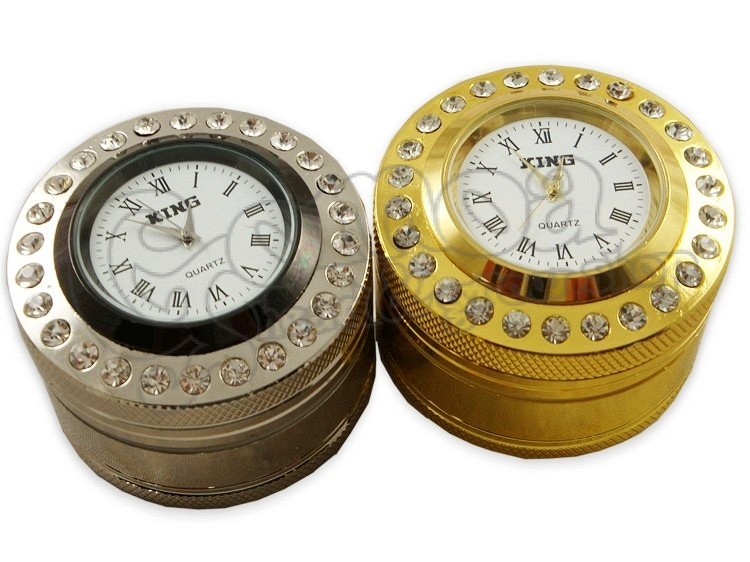 An attractive and fully functional roman numeral clock decorates the top and is surrounded by dozens of brilliant rhinestones for a luxurious look. The timepiece is also removable so you easily set the time and change the batteries as needed. Each case is also finished in your choice of polished chrome or brilliant silver. 24 super sharp interlocking diamond teeth crush even tough herbs to smithereens and produce a fluffy, consistent grind. A magnetic center pivot keeps the lid on tight even when not in use. A slip gasket lies on the inner lip providing a smooth glide while grinding. The information herein is provided by the manufacturer. Manufacturers can change product information at any time, without prior notice. We are not liable for any changes. All pictures shown are for illustration purpose only. The product may be different in reality. Our sets may vary due to current stock availabilities. If any changes occur, customers will be informed in time.